04:15:00 Makes 6 servings, 2/3 cup (170 mL) each. Makes 6 servings, 2/3 cup (170 mL) each. Fresh fruit makes a colourful, juicy and delicious treat. 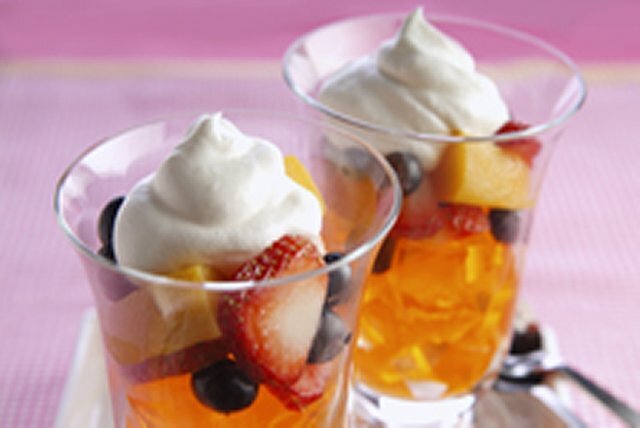 Layered with orange jelly cubes and whipped topping, this fruit medley gets all dressed up. With only 15 minutes of prep, these dessert parfaits are deliciously simple! Stir 1 cup boiling water into 1 pkg. (10.2 g) Jell-O No Sugar Added Orange Jelly Powder in medium bowl at least 2 min. until completely dissolved. Stir in 1 cup cold water. Combine 2/3 cup each blueberries, sliced strawberries and peeled peach slices. Cut jelly into 1/2-inch cubes; spoon evenly into six dessert dishes. Top evenly with the fruit mixture and 3/4 cup thawed Cool Whip 95% Fat Free Whipped Topping just before serving. Prepare as directed, using your favourite flavour Jell-O No Sugar Added Jelly Powder. Help your family eat right with this dessert made with better-for-you products. Serving Size Makes 6 servings, 2/3 cup (170 mL) each.